I think this is probably my favorite quilt for many reasons, the first being that I just love that it turned out even better than I expected. The bright red is so bold against the white and many of the design elements came together in a way I only hoped and crossed my fingers for. 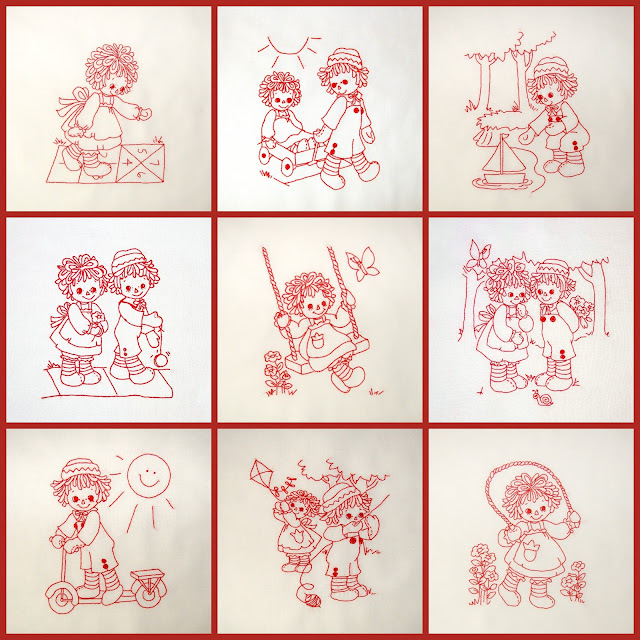 "Redwork" is a traditional style in quilting where, obviously, the only color used is red, including the embroidery. When I decided to do a Redwork, I immediately thought - Raggedy Ann. She was my favorite doll as a child. I don't know what happened to my original, but my mom gave me an 80 year commemorative one back in 1995. I used a common design lining up small squares in diagonals for a lattice-like appearance to frame the embroidered blocks. Due to the number of blocks, I needed to place blank spacers in between. AND had to decide what to do to quilt those layers together. 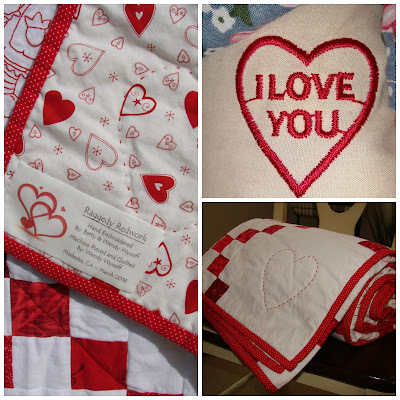 For the backing, I was thrilled to find this fun, whimsical heart fabric that also reminded me of Raggedy's heart (shown on left above and in the photos below). 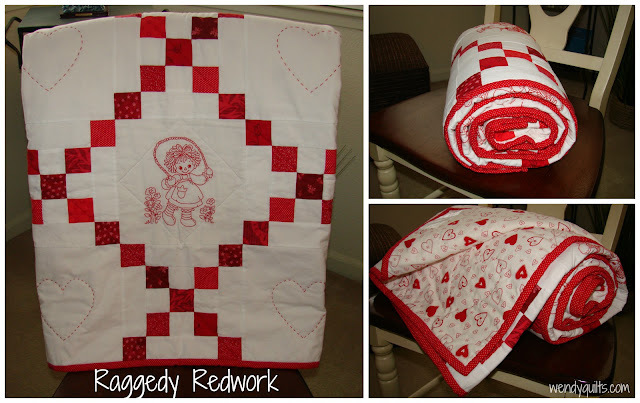 And another reason to love this quilt is that my mom and I both embroidered the Raggedy Ann and Andy blocks. My mom taught me how to sew and embroider when I was young, so having her share in creating this quilt was special! 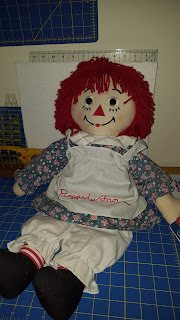 The label is always that final finishing touch after sewing on the binding which was tiny polka dots on red for this one.